Home > Heavy Duty V Belts > V-Belts. A, B, and C Sections. Standard and Kelvar Construction > A-Section (Classcial) V-belts. 1/2" Wide > A38KC Belt. UltraPower AG V-Belt A38-KC (Kevlar Cover). > 4L400 FHP V-Belt - Consumer Brand. > A38 Power King V Belt. 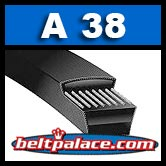 Classical A38 Industrial V-Belt. A38 BANDO Power King Belt. Classical A38 Industrial V-Belt. A Section = 1/2” Wide, 40” Length OC (965mm). 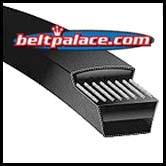 Features bias cut, insulated ultra-high strength polyester cords, superior compression section for high temperature and load carrying performance. Heat and oil resistant. High quality for low cost! Standard Classical 4L400 FHP Belt. NAPA, Grainger, PIX (low grade) A38. Replaces Durkee Atwood-Campbell Hausfeld BT-4 V-BELT. Standard. CASE/IH 59004C1, CASE/IH 822738R1, CASE/IH 826730R1. THERMO KING 78845. ALLIS CHALMERS 70822940, ALLIS CHALMERS 822940. 4L400 FHP V-Belt - Consumer Brand. 4L400 FHP V-Belt. Consumer Brand. 1/2” W x 40" Length. Replaces Classical A38 V Belt on light duty applications.